Barclaycard presents British Summer Time Hyde Park are excited to announce that special guests Richard Ashcroft, Seasick Steve, and Squeeze will be joining headliner Roger Waters on 6th July 2018 for his eagerly awaited Hyde Park show. Roger Waters will be showcasing highlights from a groundbreaking body of work with the legendary Pink Floyd, with his timeless catalogue of hits, Another Brick In The Wall, Money, The Great Gig In The Sky, Mother, Comfortably Numb and Wish You Were Here. The first guest on 6th July is a modern British rock star, Richard Ashcroft. Founding member and front man of The Verve, their 1997 album Urban Hymns became a landmark record, selling millions of copies and featured classic singles ‘The Drugs Don’t Work’, ‘Lucky Man’ and the Grammy nominated ‘Bitter Sweet Symphony’. The following year they won two Brit Awards, Best Album and Best Group, establishing them as one of the biggest acts of the decade. Ashcroft launched his solo career in mid 2000 with hit album Alone with Everybody, the first of three UK top three solo records, including his latest in 2016 These People. With a plethora of anthems such as ‘A Song for The Lovers’, ‘Check the Meaning’ and ‘Break the Night with Colour’, and a whole host of triumphant shows already under his belt, Ashcroft is reaffirming his status as one of the UK’s biggest stars. Next, an unlikely rock star with a remarkable story. Known for his custom-made stringed instruments Steven Wold, aka Seasick Steve, was in his mid 60s when he released his first solo album, Dog House Music. In 2007, he won the MOJO award for Best Breakthrough Act and arrived on the live scene, playing more UK festivals than any other artist. In 2008, Steve’s major-label debut I Started Out with Nothin and I Still Got Most of It Left was released, followed by a run of sold out tours. His 2013 record Hubcap Music, featured guest appearances from Jack White and Led Zeppelin bassist John Paul Jones, Keepin’ the Horse Between Me and the Ground, his latest record in a prolific late career, was his fifth UK top ten album. Now, the charismatic one-man blues machine will be bringing his homespun and enthralling sound to Hyde Park. Squeeze, on the other hand, are a London institution with classic songs telling tales of the capital since 1973 when Chris Difford and Glenn Tilbrook began their song-writing partnership. The result was a celebrated English songbook, famous for their lyrical wit and infectious melodies, with an unparalleled collection of hit singles like, ‘Take Me I’m Yours’, ‘Cool For Cats’, ‘Up The Junction’ and ‘Tempted’. Making their recording debut, in 1977 before disbanding in 1982, they reformed twice in 1985 and 1992. 2015 saw the release of ‘Cradle to the Grave’ followed by The Knowledge last year. The accompanying tour saw Glenn and Chris joined on stage by drummer Simon Hanson and keyboard wizard Stephen Large, plus a couple of new faces - Yolanda Charles on bass and Steve Smith on percussion. Difford and Tilbrook will have Hyde Park singing along all afternoon. On Friday 6th July, music icon Roger Waters will be bringing his Us + Them Tour to the UK for the first time ever. The Pink Floyd visionary is noted for taking his sonic and visual experimentation to breath-taking levels and turning rock n roll into theatre on the grandest scale. Waters will be showcasing highlights from his groundbreaking body of work, with songs from Pink Floyd’s greatest albums (Wish You Were Here, The Wall, Animals, Dark Side of The Moon), along with tracks from his critically acclaimed new album “Is This the Life We Really Want?”. On Friday 7th July, The Cure will play an exclusive European concert for 2018, to celebrate their 40th anniversary at a very special show. Formed in 1976 at school by a teenage Robert Smith in Crawley, Sussex, The Cure is one of Britain’s most influential and distinctive bands. They have helped shape the post punk musical landscape in the UK, bringing alternative rock to charts around the world. With more than 30 million combined sales of 13 studio albums and more than 40 singles, the band are both commercially and critically acclaimed. A stellar line up supports, Interpol, Goldfrapp, Editors, Ride, Slowdive, The Twilight Sad with more to be announced. On Sunday 8th July, Eric Clapton is set to play a very special concert, continuing the legacy of all-time greats gracing the Great Oak Stage. He returned to the Royal Park in 1996, recording a classic live concert that raised money for The Prince’s Trust, again in 2008 and has played over 200 times at the nearby Royal Albert Hall. Amazing support comes from Santana, Steve Winwood and Gary Clark Jr. with more to be announced. On Friday 13th July, Michael Bublé returns for his only show of 2018 and his biggest UK concert. The undisputed ‘King of Cool’ will be dazzling Hyde Park with his classic voice, endearing charm and sheer panache that has seen him compared with the great singers and entertainers. He has carved a unique place in the hearts of fans around the world and lit up pop charts since his debut album in 2005, bringing jazz standards to a new generation while scoring his own original hits including the unforgettable global smashes ‘Home’, ‘Haven’t Met You Yet’, ‘Everything’ and ‘Lost’. On Saturday 14th July, Hawaiian troubadour Bruno Mars will be performing fresh off the back of his ‘24K Magic World Tour’, which spans over 172 shows across five continents in support of his 2x platinum-selling album 24K Magic. The UK leg of the tour included four critically acclaimed shows at London’s O2 Arena. Now, Mars is set to return to the UK, taking to the stage at in Hyde Park with a dazzling visual production and a set-list crammed full of his chart-topping hits. On Sunday 15th July, Paul Simon will play a career spanning set, for what will be an unmissable night in the company of a true legend. As part of iconic duo Simon & Garfunkel enjoyed a string of classic releases and seven Grammy Awards before disbanding in 1970. His hugely successful solo career earned him yet more Grammy awards, including Record of the Year for 1986 release Graceland, an album widely regarded for bringing world music into the public conscience, influencing a generation of new artists. Simon was honoured with the Lifetime Achievement Award at the Grammys in 2003, inducted into The Songwriters Hall of Fame and is in the Rock n’ Roll Hall of Fame as a member of Simon and Garfunkel and as a solo artist. One of the most revered and timeless artists of our generation, Simon’s latest album, Stranger to Stranger released in 2016 attracted some of his best reviews of his career along with a hugely acclaimed UK tour. Iconic support comes from James Taylor and Bonnie Raitt, with more to be announced. Embarking on its 6th edition, Barclaycard presents British Summer Time Hyde Park is now one of Britain’s biggest and best summer events, attracting some of the greatest names in music to the heart of London’s beautiful Hyde Park. 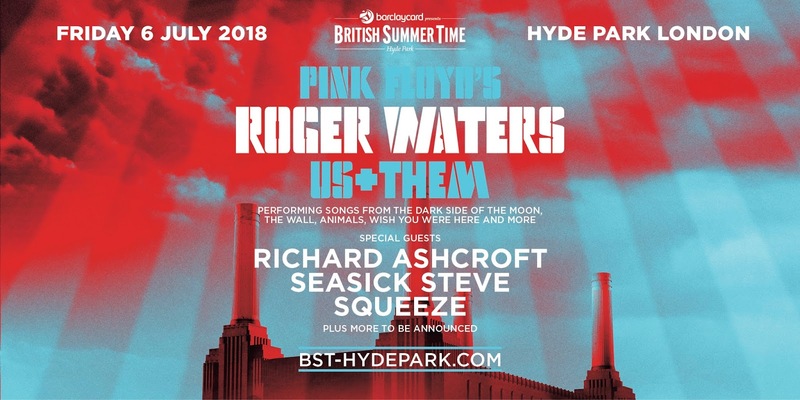 Daniel Mathieson, Head of Experiential Marketing and Partnerships for Barclaycard, said: “We’re really excited that Roger Waters, who is such an iconic figure in musical history, is the first headline act to be announced at Barclaycard presents British Summer Time Hyde Park 2018. Amazon Tickets is an official ticket partner of Barclaycard presents British Summer Time Hyde Park.